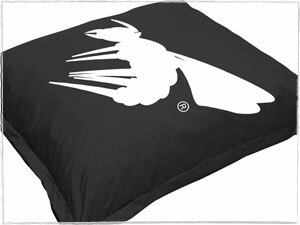 Any Quantity - Any Product - Any Design! Your business is successful because it is different from the rest, and we can reflect that in your corporate branded product. 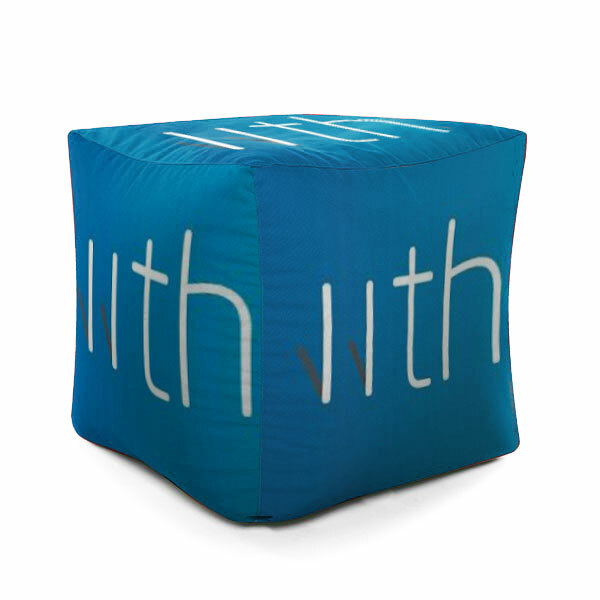 Whether it's a super-sized beanbag to suit groups of people, or a cushion or a cube simply for brand presence at a function, we have a solution for you. If you know exactly what you want, great! If not, get in touch and one of our very helpful team of assistants will guide you through your decision making process. 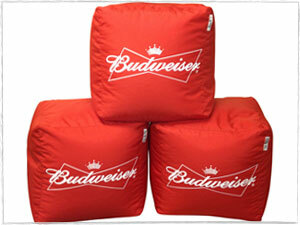 Office beanbags are being used by businesses all over the world as a way to increase employee satisfaction. 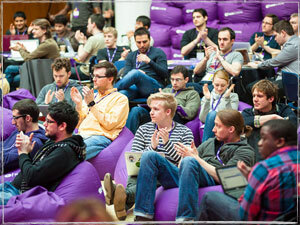 Happy employees bring increased productivity, creativity and long term loyalty to your company. 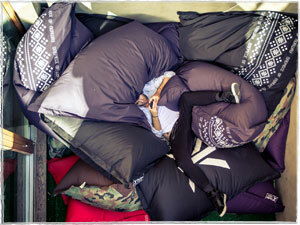 rucomfy beanbags recently supplied a number of giant office beanbags to Ignite, and they have created an excellent relaxed brain storming area for their employees in just a limited space. 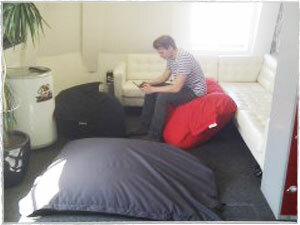 Even with the option of sofas to sit on, it’s the office beanbag which has been chosen by this employee! 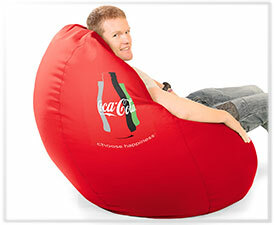 When Coca Cola needed beanbags that perfectly represented their brand whilst being super comfy and beautifully well-made, they didn't have to look any further than rucomfy bean bags! Our in house design team carefully considered the colour to make sure it was a perfect match for the brand, and ensured the logo was the ideal size and placement on the bean bag for maximum visual impact! 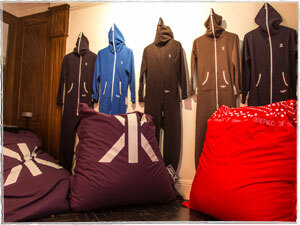 One of the many examples of our perfectionist approach to creating our branded bean bags. 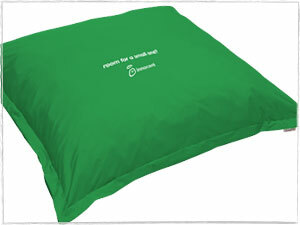 You need your company to stand out from the rest, you need customers to remember your name and products, with rucomfy beanbags Branded Beanbags you will increase brand awareness for your company without breaking the bank. That is exactly what Glaceau Vitamin Water set out to do! 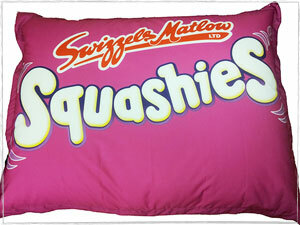 We supplied them with our Giant Indoor/Outdoor Squashy Squarbie© is a range of bright vivid colours to match their different flavoured water, to finish them off they had their logo sewn onto the beanbags! The world wide know Ice cream company, Ben & Jerry's approached us to produce some fabulous Digitally Printed beanbags for their Core Tour. 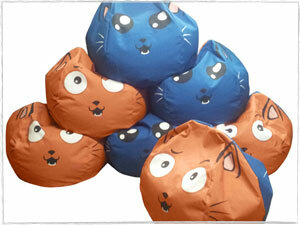 They liked the look of our Indoor/Outdoor Giant Squashy Squarbie© Beanbags but they were slightly too large for their requirements. Due to the fact we make all our beanbags in house, we were able to make a custom size for their needs and make them some funky Digitally Printed beanbags in an indoor & outdoor fabric so they could be used outdoors on their tour! 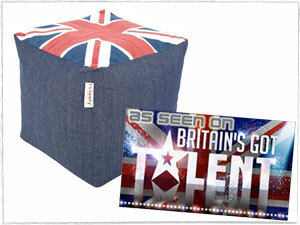 Make your business stand out from the crowd with a rucomfy branded beanbag, just like ITV! 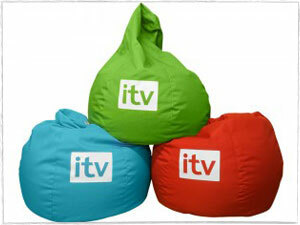 rucomfy recently supplied these branded beanbags to ITV, we can add your company logo or slogan to many of our beanbags, here in house. 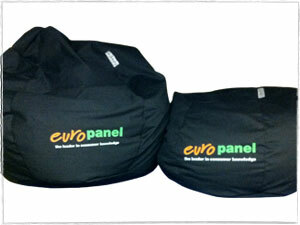 A branded beanbag will have an immediate visual impact on your customer and is perfect for brand retention. 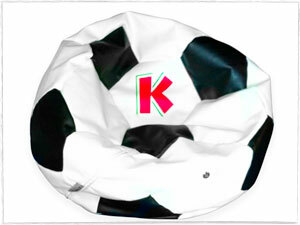 Branded beanbags are a fraction of the cost of an advertising campaign, and last far longer. Use them in your office, showroom, at an event or even place them in other companies and immediately you have an eye-catching advertisement for your business. 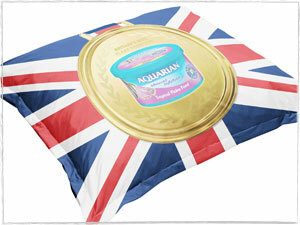 When Swizzels Matlow came up with their new range, 'Squashies' they decided to take advertising to a whole new level! 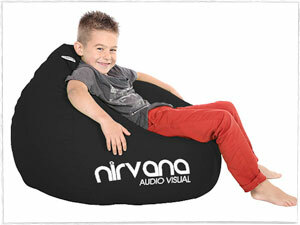 They wanted to stand out from the crowd and what better way than to get their logo Digitally Printed right across a giant beanbag, making an immediate visual impact on their customers. 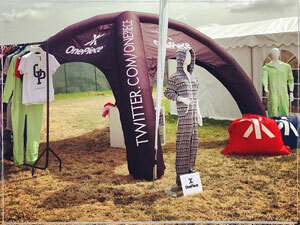 Their chosen beanbag was the Giant indoor/outdoor Squashy Squarbie© Outdoor Beanbag, meaning they could take their branded beanbags to any advertising event, indoors or outdoors. 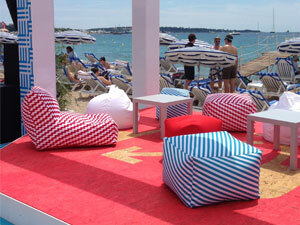 When Google needed some custom shaped beanbags for their event in Cannes, France - we were the natural choice! 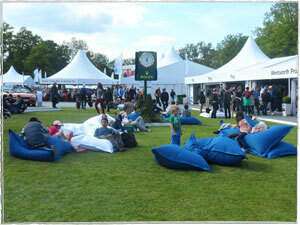 Following very specific requirements, we created a selection of beanbags in a variety of shapes and sizes, all digitally printed with vibrant patterns to match the event. One of the largest supermarket chains, Morrisons, approached us to supply 200 bean cubes for an event that they were holding. Not only did they have very strict specs for the bean cubes, there was also a very tight deadline date that was approaching rapidly! 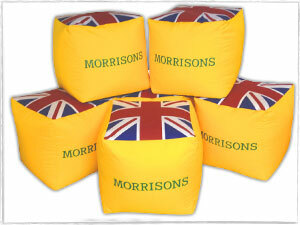 However, the rucomfy team took this in their stride and managed to Screen Print the Morrisons logo and also Digitally Print the Union Jack design onto the 200 cubes in a very short space of time, to the exact specs that were required of Morrisons. 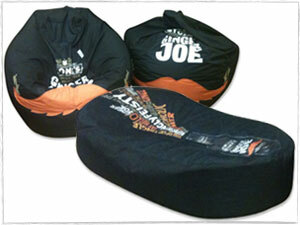 Ginger Joe recently offered us a chance to exclusively make “branded beanbags” for their in-house use in London ginger hub..and then we at rucomfy delved into our warroom to design and make the end product with great eye catching Ginger Joe design entwined with rucomfy bean bag quality... We were able to Digitally Print the final design onto the beanbags in house, meaning no matter how big or small the order, we can turn this unique designs around extremely quickly for al of our customers! 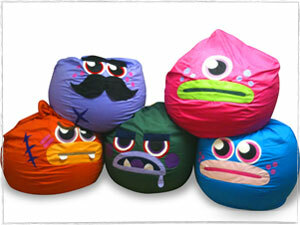 Due to our great bean bag making skills and that fact we make everything in house, we were selected to bring to life a range of monsters for the online children's game Moshi Monsters. 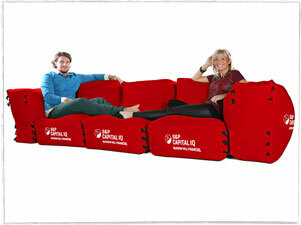 As you can see from the image, they really look the part! 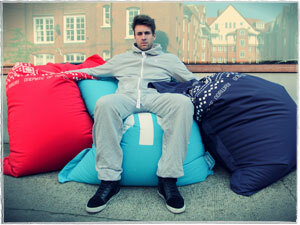 All the individual beanbags were handmade as all the features were individually cut and sewn onto the beanbag! 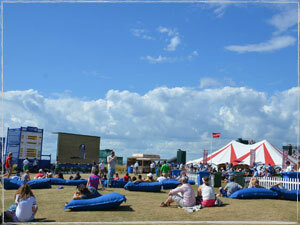 Haagen Dazs contacted us about supplying our beanbags with their logo on to Wimbledon. 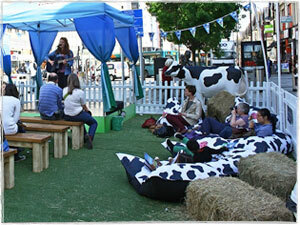 They chose a selection of our beanbags, for example our giant squashy squarbie and our solo chair. 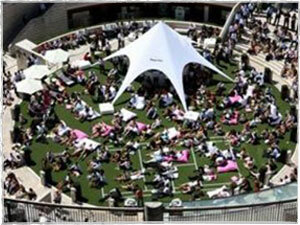 We even made some beanbag shapes to match Haagen Dazs specific requirements for this unique event. 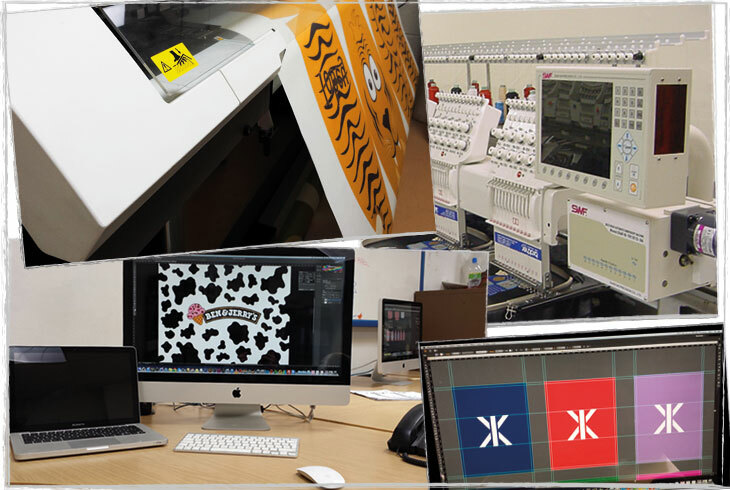 Everything was taken care by us from first contact, to Screen Printing the logo on to the fabric in house to checking everything run smoothly at the event. One of the biggest clothing brands Bench approached us for some branded Bean bags, due to the facilities we have in house, this was no problem for us! We were able to design, mock up and produce the exact beanbags that Bench required, and we did all of this in house, our specialist design team were able to Screen Print the logos onto the beanbags. 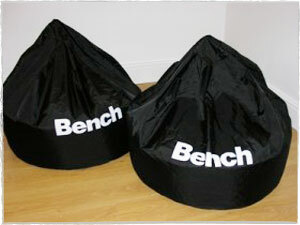 Taking all these factors into consideration, Bench chose us to produce their branded beanbags and in no time we had the beanbags branded with the simple yet effective Bench Logo, beautiful.